Southeast of Denver, out on the high prairie we sit at 5800 feet. The land is short grass prairie complemented with a very productive creek bottom. First and foremost, we are concerned about taking care of the our most precious resource which is the grass. We raise grass fed beef and lamb. Our cattle are a composite and the sheep are purebred dorper. Each year we host a Buck Brannaman at the fairgounds in Kiowa. 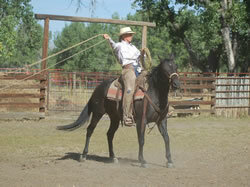 This clinic is suitable for all levels of riders and cover horsemanship and roping with an emphasis on the skills needed to make a bridle horse. Check out dates for 2019. Both Classes Are Open For Riders! We also raise border collies and use them in our daily livestock chores.